Our Motor Coach Training Program is a new addition to the courses offered at Commercial Safety College. This course has been designed with the needs of industry in mind and has been endorsed by a number of leading Motor Coach operators in Atlantic Canada. 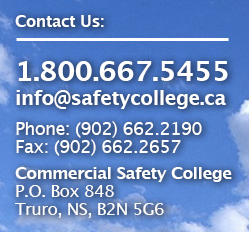 The Commercial Safety College Motor Coach Training Program has met all qualifications (academic and practical) for full accreditation for Blocks A, B, C, D, and E Core Competencies of the National Occupations Standards as administered by the Motor Carrier Passenger Council of Canada. Pass/Provide a Driver’s Medical, completed by your family physician.